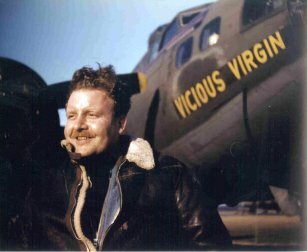 Capt Edward M. "Woodie" Woddrop (P) - Was a former RCAF Sergeant Pilot who transferred to the 303rd BG(H) in July 1943. Missions flown as indicated above. Was upgraded from CoPilot to Pilot - 1st Pilot mission 9 Sept 1943. Twenty-five mission combat tour completed on 5 December 1944. Signed up for six additional missions which he flew as a Lead Crew Pilot. Promoted to Captain for his last combat mission. Became a B-29 pilot after returning to the USA. On a B-29 transition training mission his #2 engine caught fire. He got off the B-29 through the nose wheel door and walked into the moving prop of the #2 engine. He suffered massive injuries and died on the operating table of the base hospital. 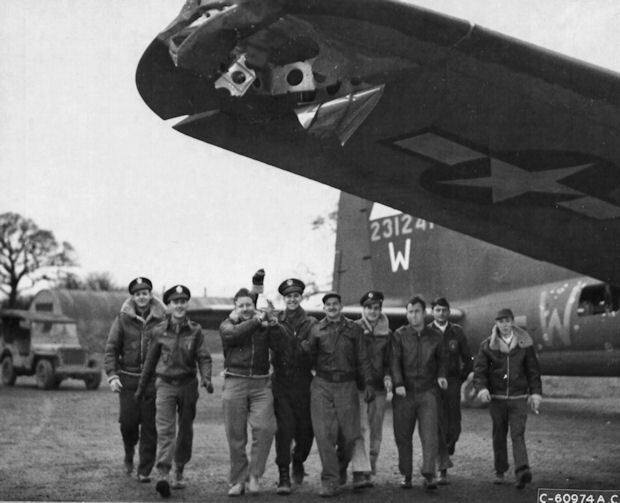 Lt Grover C. Henderson (CP) - First combat mission (70) with the Lt Woddrop crew. Flew fifteen missions with Lt Woddrop (70 to 82 & 86 to 95). Was upgraded from CoPilot to Pilot and flew as Pilot for his last nine missions. Combat tour completed on 2 March 1944. 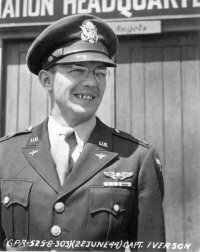 Capt Ingvald M. Iverson (N) - Flew seventeen missions with the Lt's Cardwell/Woddrop crews (66 thru 82 and 97 thru 103). Flew an additional eleven missions as a Lead Crew Navigator. Last mission (#185) on 19 June 1944. Promoted to Captain just before mission #148 on 8 May 1944. Lt Leonard B. Bierman (B) - Flew on eleven mission with Lt's Cardwell/Woddrop crews (60 thru 73). First mission (#38) 19 May 43. Final mission (#73) 12 Oct 43 with Lt Woddrop. Ten different Bombardiers used on Lt Woddrop's final 16 missions. T/Sgt Benjamin Barlow (E) - Flew on nine missions with Lt's Cardwell/Woddrop crews (60 thru 69 and 71 & 72). First mission (#22) 12 Mar 43. Final mission (#72) 27 Sept 43 with Lt Woddrop. Replaced by S/Sgt William A. Watts (E) who flew on the final seventeen Lt Woddrop missions (73 thru 103). S/Sgt Watt's first mission (#63) on 24 Aug 43. Final mission(#115) 2 March 44. T/Sgt John J. Mulholland (R) - Flew on twenty-three missions with Lt's Cardwell/Woddrop crews (60 thru 86, 97 & 99). First mission (#51) 17 July 43. Final mission (#99) 14 Jan 44 with Lt Woddrop. S/Sgt Glenn R. Allen (BTG) - Flew on ten missions with Lt's Cardwell/Woddrop crews (68 & 69, 71 thru 80). First mission (#41) 11 June 43. Final mission (#80) 3 Nov 44 with the Lt Woddrop crew. Replaced by S/Sgt Royal F. Plante (BTG) who flew on the final ten Lt Woddrop crew missions (82 thru 103). Sgt Robert M. Cooney (WG) - Flew on nine missions with Lt's Cardwell/Woddrop crews (59 thru 70). First mission (#6) 12 Dec 42. Final mission (#70) 16 Sept 43 with the Lt Woddrop crew. Replaced by RAF transfer S/Sgt Charles C. Baggs (LWG) who flew with the Lt Woddrop crew on eleven missions (71 thru 83). S/Sgt Baggs first mission (#59) 16 Aug 43. Final mission (#99) 14 Jan 44. S/Sgt Robert W. Arnold (TG) - Flew on nine Lt's Cardwell/Woddrop missions (58 thru 69). First mission (#17) 26 Feb 43. Final mission (#69) with the Lt Woddrup crew. Replacement tail Gunners then used including S/Sgt William Valis who flew on eleven missions as Tail Gunner (70 thru 83) and seven as Waist Gunner (85 thru 97 & 103). 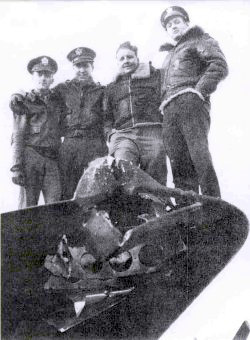 20 Dec 43 - Officers Matthews, Brown, Woddrop and Henderson on the damaged wing of B-17G #42-31241 Spirit of Wanette. 10 October 1943, Mission #77 to Coesfeld, Germany. A 155 mm shell came through the hatchway floor between the Pilot and CoPilot and out the top between the CoPilot and Engineer. The unexploded shell damaged Captain Woddrop's parachute and tore up his canteen. 20 December 1943, Mission #90 to Bremen, Germany in 427th BS B-17G #42-31241 "Spirit of Wanette" (GN-W). Wing tip and engine shot out. Five crewmen were hospitalized. Sgt Charles C. Baggs (TG) suffered a head wound and was unconscious. The two waist gunners, S/Sgt Henry Hoff and S/Sgt William Valis were unconscious with concussions and were hospitalized. The Radio Operator, S/Sgt W.S. O'Connor froze his hands getting his machine gun operative. T/Sgt William A. Watts (Eng) suffered a head injury. The chin turret and ball turret were inoperative. The electric flying suit of Lt Grover C. Henderson (CP) caught fire twice. A fire extinguisher was used to douse the fire. Lt Woddrop recommended an award for S/Sgt O'Connor for assisting the unconscious crewmen. Lt Woddrop was awarded the Silver Star Medal.